I believe there's a magic in the human ability to make something that didn't exist before our making it, and that the act of making deepens our humanity and our understanding of ourselves. The general aim of my work is to extract the great potential from the elements involved in ceramic art and bring those elements into material existence in one form. My working process is simply to muck around with my mind, heart, and hands to explore this mystery of man and material. The impetus for my own art is a deep need to create, to express myself, a need that for me is best satisfied - visually and psychologically - by working with clay, by unfolding its own "statement" in form, texture and color. My work is manifest principally in the vessel form. 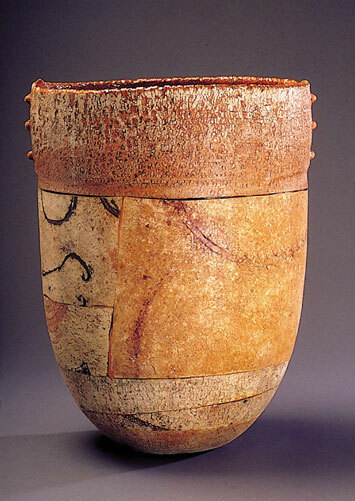 I believe the vessel is probably the purest sculptural form, bu7t my attraction to it is visceral and spiritual, not conceptual or academic. 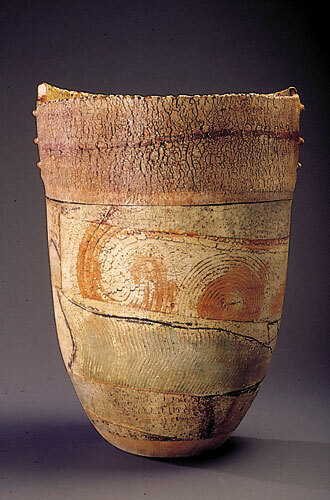 The vessel form and its making serve as a metaphor on several levels - the material is the stuff of the earth, or warm colors and geological texture; the form itself is sensual, womb-like, consisting of an inside and outside, with the rim representing the dimension where inside and outside meet, where one becomes the other. And because these are open forms, you can see inside where the core of the thing is. On another level, these pieces are related to self-identity: the outside identity of facade - of texture and color- containing an imprinted leaf inside symbolizing the core identity of the object. Similarly, the black lines on the vessels work on different levels. I believe the line drawing in itself is strongly, intimately connected to the written word. I love the look for the written word on a page, a feeling that foes back to my early love of books and reading when I was a young boy. I've incorporated the line in my vessels as a "homage" to the written word, as a reflection of the peace and serenity I associate with lines of words on a page. But it also works on a geological level, as an element on the vessels' surface texture, which is also geological, symbolizing the line of the horizon, or a line in a cave - and incorporating the strength and power of both.